1. Bottle gourd - 500 gm. 2. Besan(chick pea flour) - 5 tbsp. 3. Ginger Garlic Paste - 1 tsp. 4. Chili Powder - 1 tsp. 5. Onion - 2 Nos. 6. Garam Masala - 1/2 tsp. 4. Red chilly powder - 1 tsp. 5. Turmeric powder - 1/4 tsp. 6. Coriander powder - 1 tsp. 7. Fennel Seeds - 1/2 tsp. 8. Grated Coconut - 1 Cup. 9. Tamarind Pulp - 2 tbsp. 10. Green Chili - 1 no. 12. Oil - 3 tbsp. 1. Peel and grate the bottle gourd. 2. Add little salt to the bottle gourd and set aside. 3. After 15 mins, squeeze out the water from the bottle gourd. kofta and mix well to make dough. 5. 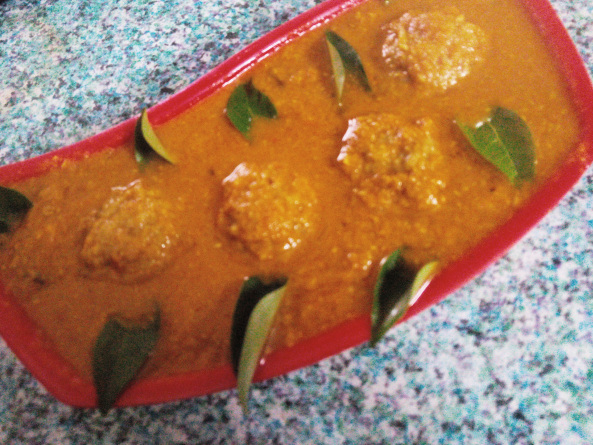 Make small balls to prepare kofta. 7. Chop onion and tomato and add it to a mixer jar. 9. Grind coconut into a paste separately and keep aside. the raw smell goes and the oil separate from the mixture. 11. Now, add the coconut paste and water. 13. Add steamed balls or fried kofta and cook for another 5 minutes. 14. Add the curry leaves and mix well. Put off the flame.